It is always fun when we can photograph our clients in multiple capacities. Our friend Dr. Hill at Pure Dermatology has been a family portrait client for years and for this portrait session, we helped her create a new image for her brand new business. Pure Dermatology Denver is a physician-owned boutique practice which strives to provide excellence in dermatologic care with personalized patient attention. Our board-certified dermatologists are committed to keeping your skin healthy and looking its best. Ready to jump start your new business or brand? Give us a call today to come into our studio or we can come to you! 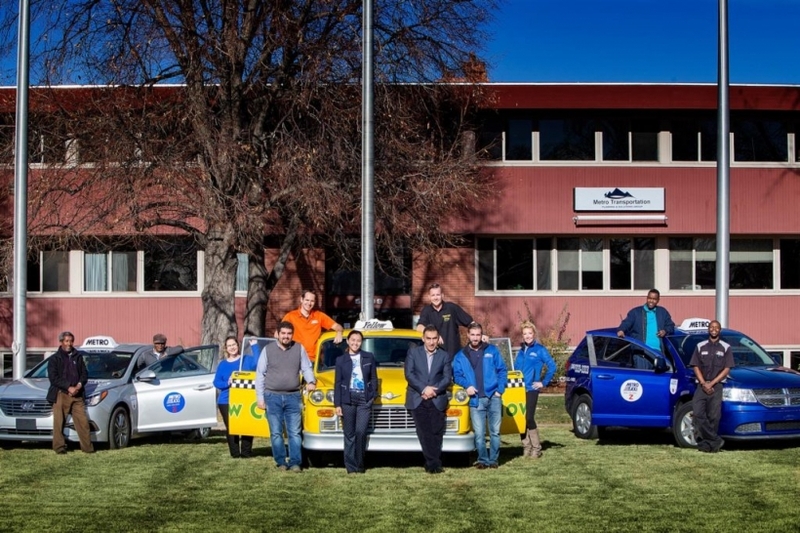 For this fun company portrait, we partnered with Colorado Business Bank and Metro Taxi of Denver. Metro Transportation Planning and Solutions Group’s mission is to provide safe, efficient, and dependable transportation in honestly, safely, and responsibly. Our goal is to be preferred over all other transportation alternatives by providing clean and well-maintained taxis along with quality customer service. Company group portraits are a great reason to get everyone in the company together, have a great portrait for your office, social media, website and newsletter! Give us a call today to book your next corporate group portrait! Dazzle Jazz Bar Celebrating 20 Years! Congratulations to our friends at Dazzle Jazz Venue. They are celebrating 20 years in business! Rated as Denver’s Best Jazz club by Westword Magazine for 15 years running, Dazzle is a live music and culinary staple in the Denver arts scene. Now located in the historic Baur’s building, Dazzle’s history is combined with one of Denver’s oldest iconic landmarks. Celebrating an anniversary, milestone or award this year at your business? Give us a call and let’s capture that memory together! The ladies of The Child and Family Therapy Center of Lowry came by our studio to update the entire companies head shots. We are an independent private group practice comprised of psychotherapists specialized in treating children ages 3-18 both individually and within the context of their family. We also treat adults, parents, and couples without their children. We love the look these ladies went for with their updated head shots, clean and bright! Cohesive head shots on your company website really make you stand out! Ready to update yours? Come to our studio or we can come to you! Give us a call today! When the amazing ladies at J2T asked us to come downtown for a group shot, I was excited to utilize one of Denver’s most famous landmarks, Union Station. We lucked out and it wasn’t too busy that afternoon and we were even able to grab a couch for everyone to sit on! Since our inception in 2000, J2T has helped companies of all sizes create thriving and incomparable teams. A highly successful boutique Finance and Accounting recruiting firm, we represent the best companies and provide them with exceptional candidates. Looking to get a group portrait done for your company? They are perfect for the office, holiday cards or e-newsletter! Give us a call today to book yours. © 211 Photography | 2018 |ProPhoto Photo Website by NetRivet, Inc.